Already adopted for network planning and operational deployment by a large OTT provider, this latest version of Aria Networks’ software suite provides enhancements for multi-layer optimization and addresses a wide range of issues faced by large fixed, mobile and OTT networks. The first customer, a US-based global brand, contracted Aria Networks three months ago, to plan and optimise network capability across its complex global multi-technology network. The project has successfully embraced both optimisation and network growth planning as well as predicting the impact of infrastructure failure on the network. Using its patent protected artificial intelligence algorithms, Aria Networks will now be running live analysis of traffic demands every five minutes to enable the network to orchestrate an optimised service for customers in real time, regardless of geography, traffic requirements or time of day. 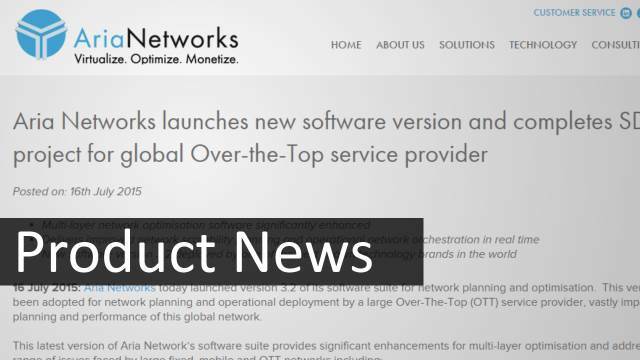 “The roll out of the latest version of Aria Networks’ software suites to this global network proves the transformational impact of a software defined approach. This complex network can automatically respond to new demands placed on it, react quickly to failure scenarios and has improved its service level to customers in real time. Aria Networks’ latest software suite delivers proven optimisation benefits regardless of the size or complexity of the network,” continues Gracie.